Join us for a book signing event! 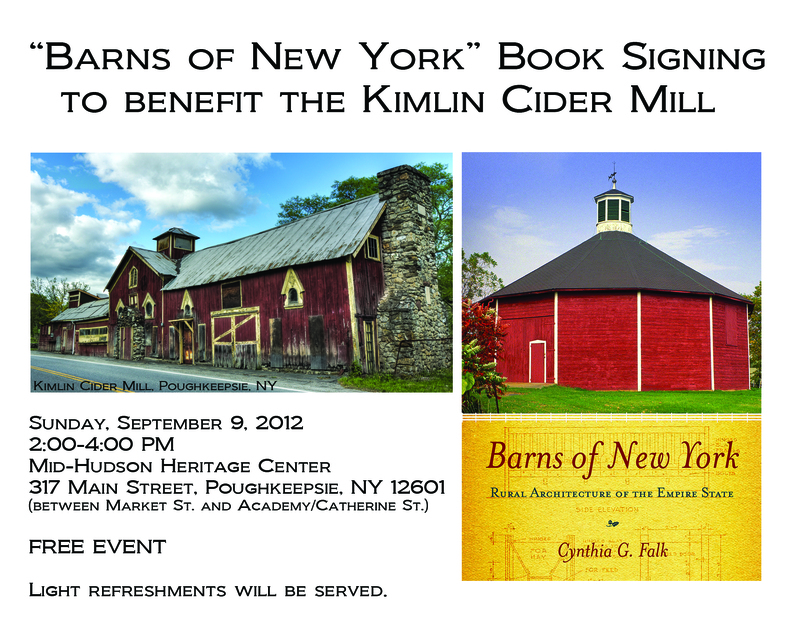 We have invited Cynthia Falk, author of “Barns of New York: Rural Architecture of the Empire State,” a book which features the Kimlin Cider Mill, for a presentation, discussion, and book signing at the Mid-Hudson Heritage Center, 317 Main Street, Poughkeepsie, NY 12601. The event is September 9, 2012 from 2:00 to 4:00 pm. Light refreshments will be provided. The purchase of books will benefit restoration of the Kimlin Cider Mill. The event is free and open to the public. This entry was posted in Events and tagged Events on August 15, 2012 by cidermillfriends.